You may have read earlier in the week how some robins at work built a nest in an interesting location. They put the finishing touches on this nest on Monday and I've kept an eye open for any signs of activity at the nest. Today we saw the female sitting on the nest some so at the end of the day I went to have a look at the nest. Sure enough, she had laid the first egg. Because the nest is a little above eye level the easiest way to look inside is with a mirror. This is a little pocket mirror I can hold but for even higher up nests we have a bike mirror mounted on a pole. It works like a charm. 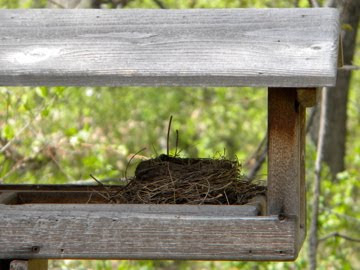 If you have a nest in your yard this spring and would like to take part in some Citizen Science you can help researchers learn more about birds though Cornell's Nest Watch Program. Warner Nature Center locally is a training site for Nest Watch as part of our partnership with Cornell. You can get certified to be a nest watcher online and then submit your data so it can be part of the effort to better understand birds. Not only is nest monitoring interesting and personally rewarding but you can help everyone understand more about our feathered friends.